Steganos Safe 20 - Safely encrypt sensitive data! Win one of the 10 licenses for Steganos Safe 20! Steganos Safe 20 is a digital vault that protects everything you don’t want anyone else to see. The clearly structured new user interface ensures that this highly professional security software package is intuitive and very easy to use. 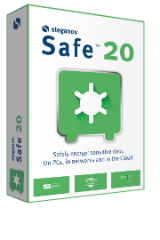 With the click of a button, Steganos Safe 20 protects all types of sensitive data on your PC, in networks or in the cloud thanks to state-of-the-art 384-bit AES-XEX encryption with AES-NI-Hardware acceleration. The program is available for $39.95, but the winners of our contest will get it for free.